After placing second behind their biggest rival Notre Dame High School in the AIA State Qualifiers last November, the Cactus Shadows Varsity Pom Dance Team had their work cut out for them. 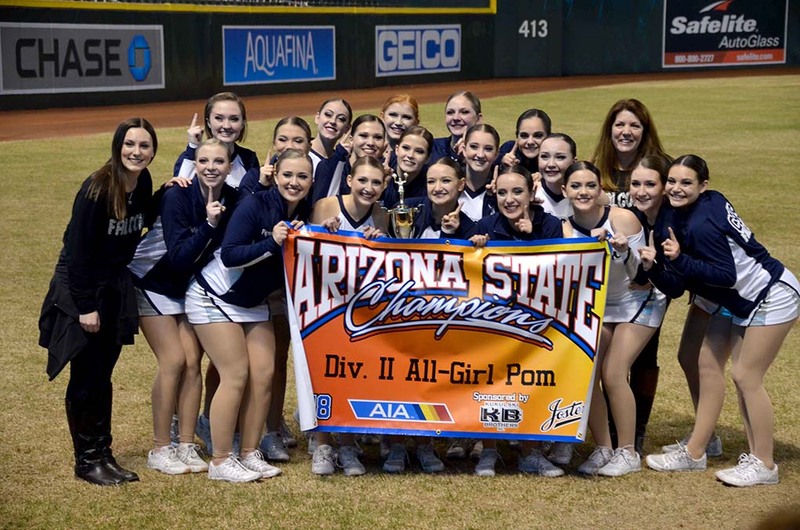 The Falcons turned the tables and defeated the Notre Dame Saints by more than 4 points on Saturday, January 20th to win the AIA division 2, all-girl pom title at the state championships held at Chase Field in Phoenix. “Four points may not seem like a big number, but in the dance competition world, we usually talk in tenths of a point separating first and second,” explains Knuteson. Senior leadership is another reason behind the team’s success. Seasoned seniors, Jenny Brown, Shannon Chumbley, Charlie Jenkins, Piper McKernan, and Emma Povinelli, set the tone and raised the bar after a disappointing performance at AIA Qualifiers. Their experience and influence helped push the team to bring home another state title, as well as lead the sideline and half-time performances at all varsity football games, home basketball games, community events and other school pep assemblies and activities. The Varsity Pom Team leaves this Thursday to take both their Pom and Jazz routines to the national stage at the UDA National Championship held each year in Orlando, Florida.